"I was born on a farm in Pickett County, Tennessee, about fifteen miles from Byrdstown and sixteen miles from Livingston, Tennessee. My dad met my mother in the year of 1919, and they were married soon after they met. My oldest sister was born December of 1920, and in 1921, my dad bought the farm that belonged to my grandfather on my mother’s side. My dad paid about seventy-five dollars down and signed a note to pay the balance as he could. Times were very hard in those days. My dad made the last payment in 1941. My grandfather didn’t charge him any interest on the unpaid balance. The total price of the farm was fifteen hundred dollars. The farm consisted of one hundred and thirty-five acres, about six acres in timber, and the rest in crop land and pasture." "After my fifth (5th) sister was born, I was born on February 26, 1930. After I was born, there were two more girls, and then my only brother, and after that, two more girls were born. There were eleven children in all, and up until 1939, ten children and my dad and mother lived in a three room house. It had a kitchen and dining room all in one, and a living room with a fireplace downstairs, and one large room upstairs. There were two beds in the living room and three beds upstairs." "My mother made quilts in the winter months, all hand made. She taught my sisters how to cook and sew at a very young age. They would make about four or five quilts each winter. It would take about four or five quilts on each bed to keep us warm in the winter months. The old house we lived in had a shingle roof and every time it would snow, we would wake up in the morning with about an inch of snow on our beds that had come through the old shingles. The beds that were upstairs had to be arranged to where we could pile about twenty-five bushels of sweet potatoes under them and cover them with old quilts to keep them from freezing." "My dad milked the cows until my oldest sisters got big enough to milk. My oldest sisters slept downstairs, and my mother would make them get up when she got up so she could teach them how to cook. My mother would skim the cream off the milk and put it in an old crock churn that she had sitting in front of the fireplace. When the cream got just right, she would churn it into butter. Our churn had a wooden lid with a hole in the center. The dasher was a wooden cross with a handle that came up through the hole in the lid. We would take hold of the handle and churn up and down until the cream turned into butter. My mother would take the butter up into a bowl, and then we would have about two and a half gallons of good ole buttermilk to drink and to make biscuits or cornbread each week." "We grew corn and shelled a bushel each week to take to the corn mill to be ground into cornmeal to be used for cornbread. We usually did this on Saturday morning. My mother would have three or four dozen eggs to sell at the store which was about three miles from where we lived. My dad would put the corn and the eggs on the old wagon that was pulled with mules. My dad would help my mother climb up into the spring seat and then go around and climb up on the other side and off they would go to the corn mill and the store. Most of the time, I got to go with them. My mother would sell the eggs to buy groceries. The only items bought were things we could not grow on the farm, such as baking soda, sugar, and coffee. The grocery bill would amount to seventy-five cents to a dollar a week. Sometimes she would buy candy with a few cents left over. We could get a big bag of candy for four cents, so there would be a happy bunch of kids. Sometimes there would not be anything left for candy." "I remember one time when I was five years old the water mill broke down and there was another mill in town that was sixteen miles from where we lived. My dad got up real early one morning and loaded the wagon with wheat and he let me go with him. We went all the way to Livingston to get our wheat made into flour. This was my first trip to town. There were very few cars at that time since very few people could afford one. But in town, there were several cars running around. What amazed me the most about the cars was out in the edge of town was a service station with a grease rack outside the building and they had a car on the grease rack. I could not figure out how they got that car upon that big pole! While our wheat was being ground, my dad took me into a restaurant and he ordered each of us a hamburger and a double cola for our dinner. That was the first time I had ever had a hamburger or a cold drink. I can remember my dad asked the lady how much he owed her, and she told him that the total bill would be twenty cents. When we got home about dark, my mother asked me what I had for lunch, and I told her a big biscuit with a sausage in the middle of it." "When I was four years old, my grandfather and grandmother lived in Kentucky, about forty miles from where we lived. My grandmother became very sick. My mother sent word by mail and told my grandfather if he would send my uncle, which was her brother, and send an extra mule for her to ride, that she would come home with him and help take care of my grandmother. A couple of days later, my uncle arrived at our house riding one mule and leading another. So my mother got ready and they left early the next morning. In those days, ladies never wore slacks of any kind, and they never rode straddle of a horse or a mule. They had side saddles for riding. About a week later, my dad got word that my grandmother had passed away. We had a neighbor that had a buggy and he insisted on my dad taking his buggy to Kentucky for my grandmother’s funeral. My dad agreed to take his buggy, so my dad hitched our mules to the buggy and he took me with him. The buggy had a top to keep us dry when it rained, and that day, it rained most of the day. It rained so hard at one time my dad drove the buggy into some man’s barn and waited for it to slack up. The wind was blowing and it was getting us wet, but when the rain slacked, we were on our way again. We had to cross the Cumberland River on a ferry boat near Ash Lock. The ferry was operated with oars. They didn’t have motors on them at that time. When we got to the ferry, there was no one there. The man who operated the ferry lived a little ways from there, so my dad walked up to his house and called for him. The river was up big and muddy and the man told my dad it was too dangerous to cross. My dad told him about my grandmother and he said, "Well, in that case, we will take a chance." My dad drove the mules and buggy onto the ferry and helped the man with the oars. After a struggle, we made it across. My dad waited to make sure the man made it back across, and when he did, we were on our way again. It was about two hours after dark when we arrived at my grandfather’s house. I can remember my uncle coming out and carrying me into the house. I was glad to see my mother. My grandmother was lying in the living room in a homemade casket. I was tired from our trip, so soon, my aunt took me upstairs and put me to bed. When I awoke the next morning, she gave me breakfast. Then I remember them bringing a wagon close to the front door. They carried my grandmother out and put her on the wagon and took her to the cemetery. My mother, dad, and I followed behind in the buggy. The funeral was at the grave side. They sang songs and a preacher spoke a few words, then everyone lined up and walked by to the view the body. Then two men laid the lid on the casket and nailed it shut with a hammer. The two men got on each side of the casket and put a rope under each end and lowered the casket down into the grave. That was the only time I ever remember seeing my grandmother. The next morning before daylight, mother, dad, and I got into the buggy and started back home. The rain had stopped and the river crossing on the ferryboat was safe. We arrived back at home after dark. Dad took the buggy back to the owner and offered to pay for the use of it, but he refused and told day that is what neighbors are for to help in a time of need. In those days, neighbors helped each other." "We had a neighbor who owned a much bigger farm than our and had some money in the bank. He would always bring his strait razor over and my dad would sharpen it for him. My dad never charged him anything for sharpening his razor. One day they were talking about the new house my dad was building for us and my dad told him that he didn’t have the money for the paint, and he still owed for the doors and windows. He asked my dad how much money he needed. I believe he told him about three hundred dollars, and the man insisted on writing my dad a check for that amount. He told my dad, you can pay me back just any time you can. He didn’t even make a note, because he knew my dad was honest and just a hand shake was all he needed. When we got the house finished, the total cost for the house was five hundred dollars plus a lot of hard work. I remember one time one of my sisters got very sick, and this same man that loaned my dad the money for the house had a brother-in-law that was a doctor in Willow Grove. My dad went to the man’s house and his wife called her brother, the doctor, on an old crank telephone that used batteries. Back then, doctors made house calls. The doctor could only get to his sister’s house in his car, because the road on to our house was too bad for a car to travel. The doctor’s sister had a horse that was broken to ride, so the doctor rode the horse on to our house. When he finished with my sister, he told my dad that would be three dollars plus a dollar and half for the medicine. My dad told him he would have to pay him later, that he didn’t have any money. The doctor told my dad that he liked good country ham and asked him if he had one in the smoke house. My dad told him he did, so he said if you will give me a ham, that will take care of the bill. My dad got him one and put it in a sack and he told my dad he would come back the next week to check on my sister, for she was very sick. The doctor came back the next week. My dad told him he still didn’t have any money, but my sister was much better. The doctor said, "I see you have some old hens running around in the yard." He said, "Catch me three of them and I will take them by the store and sell them and that will take care of the bill." So we caught three old hens and tied their feet with a string. He rode on horse back to his sister’s house where his car was." 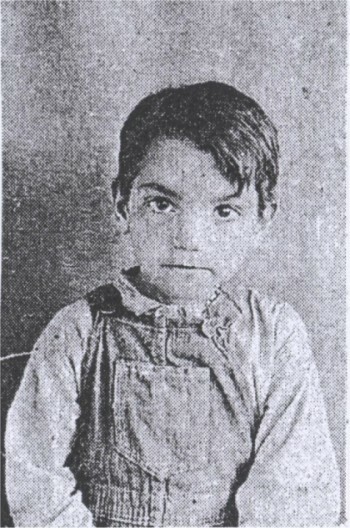 One of eleven children, Oliver Flowers is shown here as a very young boy. "When I was 13, Dale Hollow Dam had been finished. The lake was about a quarter of a mile from our house. I loved to fish, so I wanted me a boat. At that time, the war was going on, and there were no boats with motors, but all I wanted was just a rowboat that I could paddle around on the lake and fish. We had a big yellow poplar tree over in the woods, so my dad and I took the old cross cut saw and went over to the old tree and went to work. When we got it sawed down, it was a little over twenty inches at the bottom. We went up about eighteen foot and cut off a log. Then we cut two more logs ten foot long off of it. We went to the barn and got the mules and a chain and dragged the logs to the bank so we could roll them on the old wagon. My Uncle Herman had a saw mill. He lived about six miles from us, so we hauled the logs over to his mill. After sawing the logs into boards, we took the lumber home and started building a boat. When we got it finished, we put in on the old wagon and took it to the lake. We backed the wagon down into the edge of the water and pushed the boat off. Of course we had some leaks, so we got some old rags and a screw driver and stuffed the rags in wherever we seen a leak. Then when the wood swelled from being in the water, it was good and tight and it didn’t leak anymore. We had to leave the boat down at the lake, so we had attached a long chain to the front of it and we found a good place to keep it and a good tree to put the chain around. We put a pad lock on it so no one could take it. I could hardly wait to take my first fishing trip. I was the only boy in the neighborhood that had a boat. I wouldn’t even try to guess how many miles I paddled the old boat. I could go probably five miles an hour. I didn’t own a reel and rod so I used just a cane pole. I did most of my fishing with worms. I would dig me a can of worms and get my old cane pole and go down to my boat and start fishing. Sometimes my dad would have time to go with me, but a lot of the time, I went alone. I used the boat for about three years, but then they outlawed that type of boat. They wouldn’t allow you to keep it at the lake. I would have had to take it out of the lake and take it home each time I used it. I could not do that so they took the boat. I don’t know what they did with it. I suppose they destroyed it. That was in 1946. I was sixteen years old and was going to school." Avis Flowers Knight; Nellie Flowers Daniels; Lillie Flowers Kennedy; Opal Flowers Franklin; Valeria Flowers Combs; Oliver Flowers; Hazel Flowers Flippen; Junice Flowers Copeland; James Robert Flowers; Oma Jean Flowers Bowman; and Mazelle Flowers Melton. Oliver met his wife, Jean (Francis) Flowers, in 1956 in Midland, Texas. Jean was working for his sister, Lillie, as a waitress in Lillie’s Drive-In Restaurant. Jean said it was "love at first sight." After living and working in Texas, Oklahoma, and California, the Flowers moved to Tennessee in 1974, and in 1982, they began their very successful business, "Jean’s Hotdog Stand." 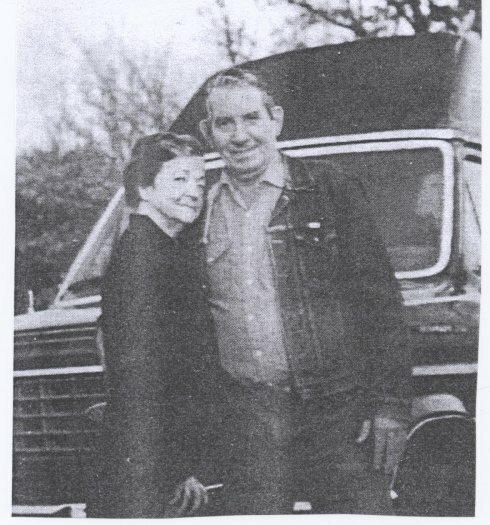 After Oliver’s retirement, he and Jean moved to Crossville, Tennessee, where they lived at the time of his death. Many people who remember Oliver knew him from the years he worked as a butcher at Jerry’s IGA here in Livingston. I appreciate Jean’s willingness to allow me to share bits and pieces from her husband’s life growing up near the old Eagle Creek ferry crossing in Pickett County. The life he describes when he grew up is far from how things are today. I’m so glad he took the time to preserve his memories in this way so they can be read and enjoyed by others today. Copies of Oliver’s book can be purchased for $5.00 each by writing or calling Jean Flowers. Her mailing address is: 272 Don Kerley Road, Crossville, TN 38555. Her telephone number is 931/484-3396.